Over the Christmas holiday weekend, we headed to Yosemite National Park. With Tioga Pass closed for the winter, it’s a long drive over Donner Pass (I-80) and then south in California. 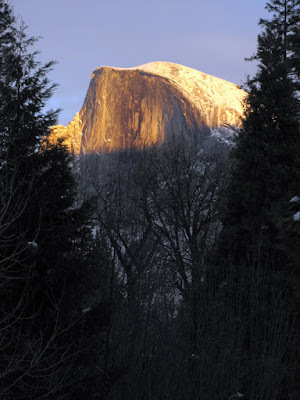 We left Reno at 9 a.m., made a few stops along the away, and checked in the the Yosemite Lodge around 4 p.m. We took a walk in the twilight along Yosemite Creek, in time for a gorgeous sunset lighting on Half Dome (above). The main activities were a hike partway up the Yosemite Falls Trail on Sunday and a snowshoe hike into the Mariposa Grove of Sequoia trees on Monday. Yosemite is a wonderful place.